What? No formal review? Well, being that the pedal is less than 24 hours old, and I gigged with it before doing a full review, I thought that I’d share how it performed first before giving it a rating. I do a solo acoustic gig at local restaurant every Friday. Rig-wise, my rig has been very simple: An acoustic/electric and a DigiTech Vocalist Live 4. I’ve brought amps in the past, but usually err on the side of convenience to keep things as simple as possible. The Vocalist Live has worked fine for several years, and it’s easy to hook up to the PA and go. Unfortunately, it’s showing its age and wear and tear from using it so much (I do at least two gigs a week where I use it). Lately, the guitar input has been crackling a little, so I’ve had to use the “Thru” jack to go out to the PA. That’s not a problem, but typically a raw signal into a PA can be a bit muddy and harshly so. BOSS may be considered a bit too mainstream for most people’s tastes, but I have to hand it to them. They’ve created some wonderful pedals in the past that have served to define certain tonal genres; for instance, the CE-2 Chorus. Now, I’m not saying the RV-5 is a standard by any stretch of the imagination. But considering how long BOSS (Roland) has been around, they do know how to get some great sounds. And the fact that almost everything they make is pretty affordable, that’s not a bad thing at all! Add to the fact that BOSS pedals seem to last forever, and that is a testament to their build quality. My thought is that BOSS has always been able to produce “giggable” tones at a great price that may not be absolutely perfect or the ideal I may be after with a particular tone, but they’re well-built, reliable, and I can get my tones “close enough” so that most folks would never notice. Hell! I had my all-digital CE-5 on my board for years, and no one was the wiser (though, of course, it’s no match to the liquid, smooth tones of the CE-2). I wasn’t expecting much out of the RV-5. After all, despite BOSS’s longevity in the marketplace, most of their new stuff is simply okay. But when I auditioned the pedal at the shop, going through a PA system, I was really impressed with its tone – especially with the “Plate” setting, which provides a nice, warm and snappy reverb that’s ideal for acoustic guitar. I didn’t play too much with the other reverb settings at the time, but I was really pleased with the Plate just the same. On that voicing alone, I knew I had a winner for my gig yesterday. The other thing that REALLY stuck out for me was that the RV-5 is dead quiet. No errant hiss or artifacts at all, and that is a real delight, not having to deal with line noise. So last night, I ran my guitar into the Vocalist Live, went out the “Thru” jack, into the RV-5, into the Radial ProDI, then straight into the board. I was crossing my fingers that it would work, and it work it did! I was pleasantly surprised about how transparent the pedal was! My Stratacoustic Deluxe has this quirky, but pleasing jangle from the Tele lipstick pickup in the neck that I absolutely love, and I was actually concerned that I’d lose that with the RV-5. But my concerns were all waylaid as that jangle was retained. What I discovered through tweaking the pedal last night was that I actually like the “Hall” setting quite a bit, and switched back and forth between “Plate” and “Hall” all night. I really didn’t get into the “Spring” setting that much, and frankly, I’ve never really liked digitally modeled spring reverbs – even the Lexicon spring that’s on my Hardwire RV-7. But that’s just a nit. It’s not bad, but it’s not really my cup of tea. I tend to like a more spacious-sounding reverb. 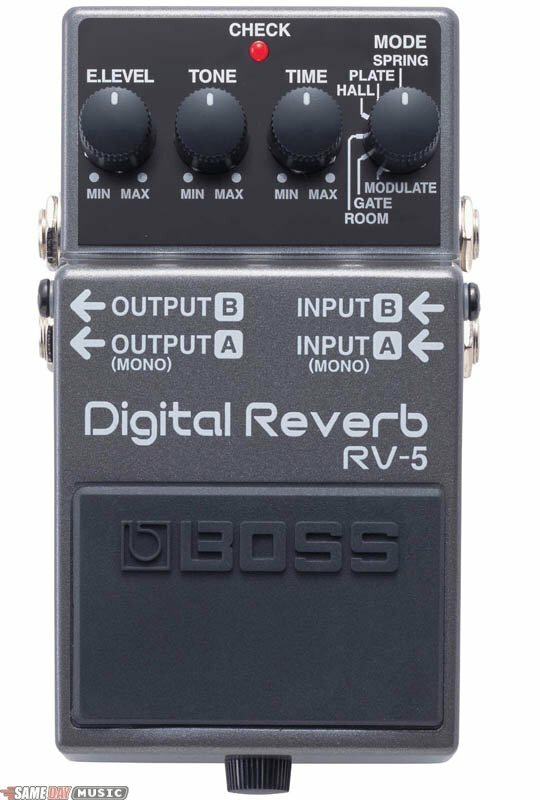 So all in all, I really dig the Boss RV-5. I’ll do a full review in the next couple of days! No. But the RV-3 is. I’ll have one of those one of these days. Wow! That’s a strong statement. Pray tell! Share your thoughts on what makes it so great! I love hearing this stuff! Most of my board is comprised of either Boss pedals or modded Boss pedals. I find them to be wonderful. The main exception is my reverb. I did love the RV-5 when I tried it, but I found the Electro Harmonix Holy Grail Nano to be one of the best reverb pedals I have used. No coloration of the sound at all. It just adds the reverb. I do find that if you turn the dial past noon it is overpowering though. It only has 3 modes compared to the 6 modes of the RV-5. Spring, hall and flerb. Flerb adds some flange to it, but I don’t use that setting. Definitely worth checking out. Heard some good things about the Nano, but really didn’t like the Holy Grail as much as I like the Hardwire RV-7, which I chose over it. The spring on Holy Grail was real nice, but I liked the other modes of the RV-7. The combination digital reverb and delay does it for me. Every demo video and the few times I’ve heard the RV-3 live has made me want it more. That RV-3 sure can do the ambient stuff really well. And I think that’s really what differentiates it from the RV-5. They’re really two different pedals altogether. Considering the two letter designations are based on function, perhaps BOSS should’ve named the RV-3 the RD-1 or something to that effect (excuse the pun).